Home » Atheism » behemoth » Bible » Bible and Interpretation » Book of Job » chaos » David Penchansky » God » Hebrew Bible » Hebrew Poetry » James Metzger » Job » Leviathan » Yahweh » Is Job's God Worth Worshiping? 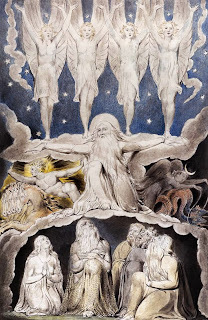 One of my favorite sites, Bible and Interpretation, has an excellent article by James Metzger on the book of Job and whether the god depicted there is one worth worshiping. Why Atheists Should Read--And Love--the Book of Job, is a thoughtful and close reading of the text. If such a reading were at all true to the book, we might safely say that it’s not even worth the paper that it’s written on, tear it from our Bibles, and send it through the shredder. For, life in this world teaches us that patient endurance amid suffering often is not rewarded, the cries of people in pain frequently go unheard, and fidelity to God is just as likely to result in unhappiness as it is in happiness. The challenge of the book of Job is to actually read it as though you didn't already know what it was supposed to say. When one does read it as though for the first time, one sees the lack of a moral order in God's dealings with humanity. What the book really – and brilliantly – does is upend traditional theistic commitments to divine benevolence, a universal moral order, and the meaningfulness of suffering. In fact, we might go so far to say that for any who resonate with the portrait of God offered by the book’s reliable narrator, by Yahweh’s two speeches from the whirlwind, and by Job himself – the only human character said to have spoken “what is right” about God (42:7-8) – voluntary relations with this deity are at an end. Put differently, for readers persuaded by the book’s characterization of God, religion is no more. When Job wonders why God doesn't live up to his own standards of justice, he is bullied into submission by a God who thunders at him, clarifying who is powerful and who is not. God's reply (38-41) is one of the most frightening scenes in scripture, and contains one of my favorite poetic passages. After God informs Job how little he understands even the animals that he is familiar with, he turns to the mythical creatures of behemoth and leviathan, about which Job knows even less. Leviathan, a sea monster, is a symbol of the chaos present at creation. Will it make many supplications to you? to be taken as your servant for ever? God continues to mock Job as a weakling. Not only can God fish out chaos like a trout, he can make it behave as a pet. Metzger recognizes the power dynamic and the lack of concern that God shows for Job and his suffering. We are, it appears, entirely on our own, abandoned in a dangerous world where the chaotic forces symbolized by Behemoth and Leviathan threaten us at every turn, forced to carve out a little habitable space and implement justice ourselves. God seems to care nothing for justice as we envision it, so if we want the cause of society’s most vulnerable to be heard and those who exploit them to be held accountable for their actions, it’s up to us to make sure these objectives are met. God will be of little – if any – help. Indeed, as sheer power and caprice, he’s just as likely to turn on us (as he did on pious Job) as he is to assist us. This is a very good article that challenges the reader to pay attention to how the text actually portrays God, and not to overcome by our preconceptions of how God should be. A colleague of ours, David Penchansky, has a similar take on the book of Job in his work, The Betrayal of God; Ideological Conflict in Job.